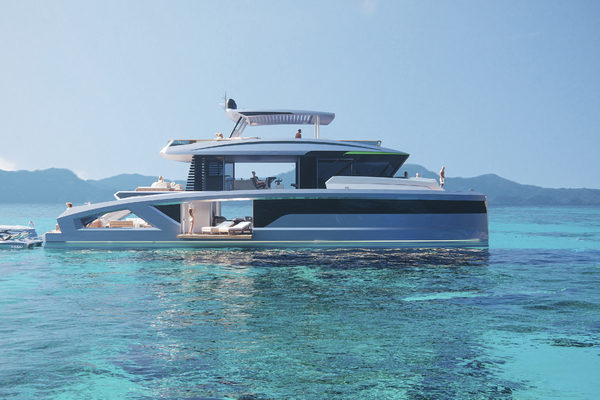 The SILENT 80 is the latest development of a SILENT model and features an abundance of luxury features. This fully new developed catamaran is based on the knowledge and experience of the SILENT 64 and offers ultimate luxury as well as fully customizable layouts for up to eight guests and two to three crew. The two stern lazarettes can be exten ­ ded and adapted to the owner's needs, you can find a whirlpool on the fly deck and there is a lot of space for water-­toys. The SILENT 80can carry a 5m+ tender, two jet skis, an amphibious car, a gyrocopter, several bikes and a motorbike. In addition the SILENT 80 is able to cut an excellent figure as luxury charter VIP Shuttle. West Florida Yachts would love to guide you through a personal showing of this 80' Silent-Yachts Silent 80 2018. This yacht for sale is located in Palm Beach, Florida. For pricing details or a showing please contact us by filling out the form on this page and we will get back to you shortly! The following technical specifications ("Specifications") describe in detail the technical elements of the construction of the Solar Yacht SILENT 80. All components are marine grade and have a CE certificate, wires copper and tin coated, stainless steel ASI316 or higher, all visible ss-part polished. SILENT 80 has been designed and is built in accordance with the ISO rules and in compliance with the safety standards according to the 94/25/CE directive. Light displacement and performance predictions subject to change due to specification of vessel. High quality and osmosis free vinyl Esther resin. Additional thermal insulation between hull and furniture/wall and ceiling covers, >50 mm + aluminum moisture barrier - all around the hull and superstructure. Furniture with foam or honeycomb inside where applicable, all parts where hinges/ locks ... have to be mounted are in special light weight plywood. Heavy plywood shall only be used in places where it is mandatory Gelcoat color acc. RAL for all glass fiber reinforced plastic parts Built in accordance with CE regulations. USCG and MCA on Request. Gas exhaust piping will be covered with thermal insulation sandwich for an optimum thermal insulation. All components of the exhaust system (hose, water lock, gas-water-separator, muffler) will be supported by visco-elastic elements / rubber supports, the generator with a double layer of rubber supports. Extraction and ventilation ducts realized with thermal insulation sandwich secured with needles. Sides, ceilings and bulkheads will be covered with thermal insulation sandwich secured with needles finished with aluminum plates secured in aluminum grid supports. The garage will be set up to receive a tender with a maximum length of 4,40 x 2,10 m e.g. Williams Sports tender 440 (supplied by the customer). The generator and other technical equipment are placed in the stern compartment of the starboard hull. Access through a deck hatch with s/s stairs and a hydraulic stern hatch with power pack for both hatches linked to power-pack of (optionally retractable) flybridge roof. Access through a flap in the transom behind the cockpit (approx. 2.000 x 500 mm) and two large hatches in the cockpit floor. This is intended to be used for water toys, SUP’s, kayaks. Entrance via stairs from the salon and via a (removeable) s/s ladder with teak steps from the front deck. (a) Oven (Miele Marine) - t.b.s. (b) Induction cooktop (Miele Marine) - t.b.s. (c) Side by side refrigerator (Samsung or LG) - t.b.s. (d) Dishwasher (Miele Marine) - t.b.s. (e) Washing-dryer (Miele Marine) - t.b.s. (f) Wine cooler - t.b.s. All the sofas, chairs, armchairs and bed heads can be selected by the customer amongst the standard decor and material samples or similar present at the shipyard showroom. All leather or artificial leather parts with double stitch at all edges and corners. All mirrors provided and installed are in smooth glass as in the General Arrangement. Door handles can be selected by the customer from FORESTI E SUARDI mod. 260A.CC or similar, and cylindrical locks and hinges. Toilet Units Toilets PLANUS mod. Artic plus 24V white. The following technical specifications ("Specifications") describe in detail the electrical elements of the Solar Yacht SILENT 80. Batteries, MPPT- charge regulators, solar panels, inverters, e-motors, generator, motor and solar displays. Each battery module comes with an integrated battery management system (BMS). This is an intelligent electronic module, that measures all cell voltages and temperatures to control balancing on both battery cell and module level. The battery modules communicate by a galvanic isolated CAN-Bus with the Master BMS, which collects and monitors the status of all battery modules. If the measured values from a battery module exceed the limit, the Master will automatically act to protect the connected battery modules. Monitoring and control EM-Display monitors and controls all battery systems. The high-resolution display with integrated touch screen shows all important battery parameters at a glance. The integrated Wi-Fi-module will connect the display to the cloud and makes it possible to remotely monitor your systems with our Energy Portal. (r) Hose clamps all high-quality s/s, for pressurized water, fuel, blackwater and under the waterline all clamps double. a) Self-priming electric bilge pump units at hulls (6x) – t.b.s.